The Hong Kong ICT Awards was established in 2006 with the collaborative efforts of the industry, academia and the Government. Steered by the Office of the Government Chief Information Officer, and organised by Hong Kong ICT industry associations and professional bodies, the Awards aims at building a locally espoused and internationally acclaimed brand of ICT awards. 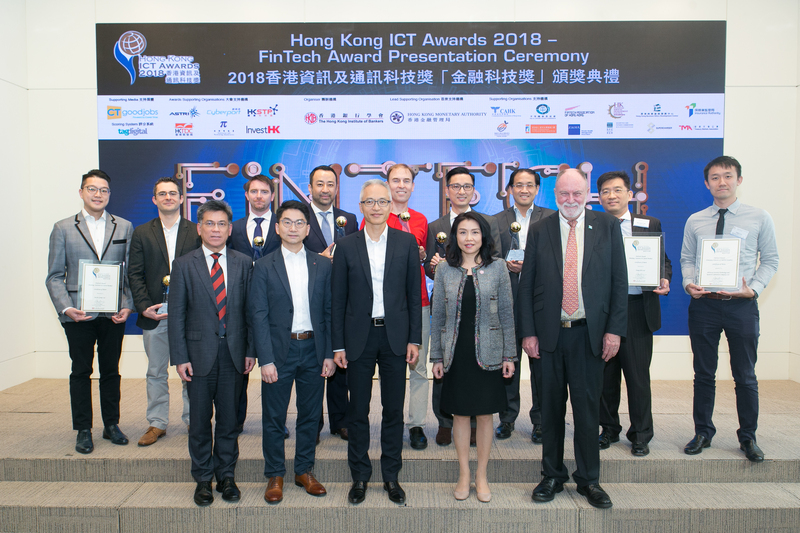 HKIB is honored to be the Leading Organiser of the Hong Kong ICT Awards 2019 - FinTech Award, the fourth consecutive year since its launch in 2016. There will be one Grand Award in each category, and an “Award of the Year” will be selected from the eight Grand Awards by the Grand Judging Panel. In encouraging the development of fintech innovation and solutions (such as cybersecurity/ anti-fraud, payment solutions, clearing and settlement systems, big data management, etc.) for enhancing operations and fostering new modes of business for the financial sector, the Best FinTech Awards aim to develop Hong Kong into a financial technology hub. The financial sector includes banking, insurance, securities trading, as well as fund and asset management. This FinTech Award would synergise, promote and recognise our FinTech community as a major player and force in the strategic development of Hong Kong as an innovative financial hub. To ensure that the Awards principally reflect the work and progress of the local fintech sector, only companies registered locally in Hong Kong should submit applications. A significant part of the planning and development effort must come from local resources. Development tools can harness local or overseas software, but more weight will be attached to entries that demonstrate the use of local products. Please refer to the prospectus for details of call for entries. The adjudication for the FinTech Award has successfully completed, and winners will be announced and accept their awards at the Awards Presentation Ceremony. To celebrate winners’ success, you are cordially invited to the FinTech Award Presentation Ceremony, and to meet with industry experts, regulators, and our award assessors and judges, to share the latest FinTech updates and success storeies in Hong Kong! For enquiries, please e-mail fintechaward@hkib.org . We look forward to seeing you at the Awards Presentation Ceremony! 1. Registration subject to confirmation from HKIB. 2. Information provided during registration will be accessible by HKIB only. 3. You may make substitution up to 1 week before the event, subject to HKIB approval. 4. Confirmation will be sent via email one week before the event commences. 5. We reserve the right to cancel, modify and/or postpone the event. 6. The event will be cancelled if No. 8 typhoon signal or black rainstorm warning is hoisted on the event day.